On this site you probably won't see a lot of coverage of Army's non-football intercolegiate sports - but last night's USMA brigade boxing championship has good reason to be mentioned. ESPNU's boxing promotion was a great venue and ESPN brought particuarly good production value - even for their standards - and had the added benefit of giving the U.S. Military Academy national TV exposure on a slow sports night. Head football coach Rich Ellerson made an appearance on the brigade boxing and did an interview with ESPN boxing commentators Teddy Atlas and Joe Tessitore. 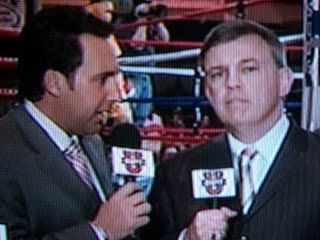 Teddy Atlas is one of my favorite sports personalities and he didn't disappoint last night. In the short interview Rich Ellerson was asked some of the most basic questions one could predict: "What about the option?" "What about the Academy?" "What about 2010?" Coach Ellerson commented that the coaching job at Army is a great job and touted Army's rich tradition. He said that they look forward to working hard for next year and noted that spring ball starts in two weeks. Answering Tessitore's question about his offensive and defensive schemes, we were subjected to characteristic coach speak from Coach E. who says that Army is becoming exceptionally skilled at the option and that they are -if anything- unique on defense, calling the Double Eage Flex "the option of the defensive side of the ball". It's nice to see any sort of Army football coverage on TV during the holiday season... and this event looked special from the prime time production to the fights to the level of class that the USMA inherantly displays. Teddy Atlas had me in stitches when they looked ahead at Army's 2010 schedule. "That's not too easy a schedule." said Atlas. "Ball State ended up playing pretty well." I don't know... maybe he meant Temple? I suppose getting the Christmas day P.R. is worth having Ellerson deal with boxing commentators regarding football matters. Ellerson was to the point: offense, defense and kicking game - stressing the importance to thrive in all phases aof the game. Don't think for a minute that I took my eye off of Pitt's most complete season since 1982. I'm back in Pittsburgh for the week and I'll be hitting up some of my old stomping grounds in Oakland today with the Meineke Bowl as the main course of the day.